How do you think the world's hardest game should look like? Don't spend your time on blind guess, click to launch the game and see for yourself. It's both simple and hard at the time, so everything depends on you! 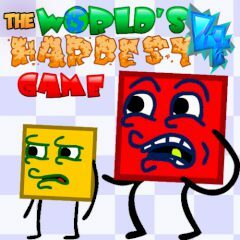 Close the door and turn off your cell-phone, as the time for the world's hardest game has come. Spend your time on completing its difficult levels and finish the game having all coins. Move the red block among rotating blades, gaps and other obstacles. Mind the color of the floor, it will give a hint about its condition.